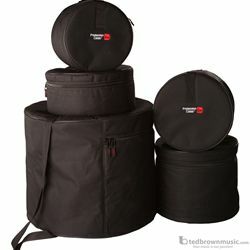 Fusion Drum Set Bags: 22" x 18", 10" x 9", 12" x 10", 14" x 12", 14" x 5.5". Durable 600-Denier nylon construction with 10mm padded and lined interior. Comfortable carrying straps and collapsible compact design for easy storage.